So Easter is nearly here, yet when I looked in my pantry today, I found I still have Easter Eggs from last year. So time to use up those eggs in a few chocolate recipes. 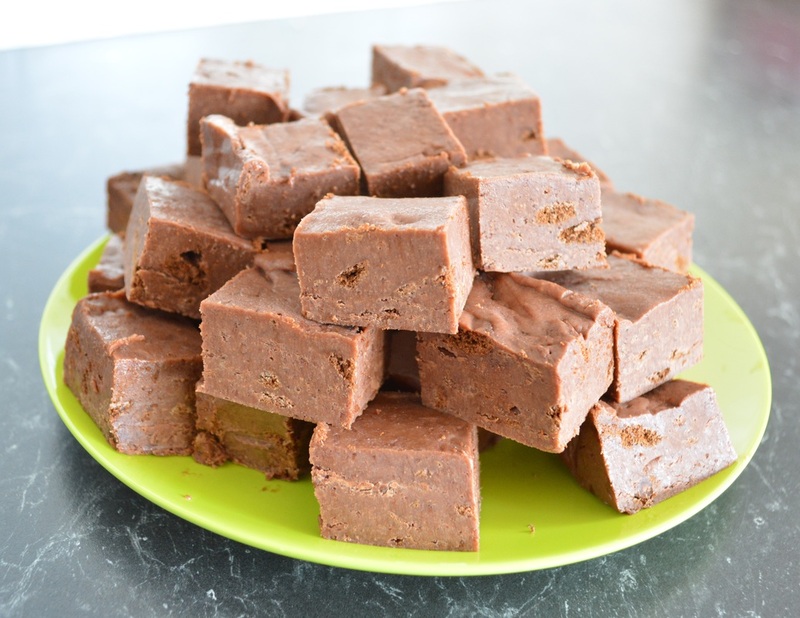 Quick google search led me to this super easy 4 ingredient fudge. Now I melted the chocolate in the microwave as per recipe, but you could just as easily melt it on the stove in a heatproof bowl over simmering water. 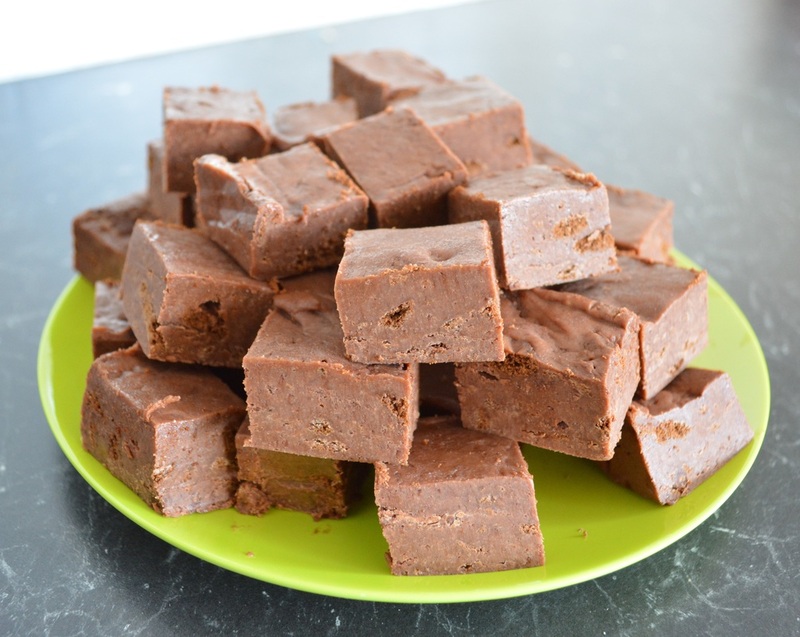 This is a bit of an Australian recipe, as it incorporates our beloved Tim Tams and Milo. I love the crunch you get from the Tim Tams, so don't crush them up too much, you want a few Tim Tam pieces in the fudge, not just crumbs. You can roughly chop the biscuits with a knife, that is the preferred method or if you are like me, you can gently bash the packet with a rolling pin, just remember don't over bash it, you don't want crumbs remember. Also, at the moment Tim Tams has gone all out with there flavours. So today I used what I had at home which was the espresso flavoured Tim Tams, so my fudge had a lovely coffee flavour to it. So I suggest you can use your original Tim Tams, or experiment with a few of the flavoured ones. This is sweet, so bite sized pieces are recommended, but I have to admit, we didn't just have one each. And I like it straight from the refrigerator, I find it tastes so much better cold. if you get a chance visit www.bakeplaysmile.com I quite like her blog, I visit it quite often myself. Give this a go, it really is so simple to put together, and does taste really good. Grease and line with baking paper a 20cm x 20cm square baking tin. Remember to allow two sides of the baking paper to overhang so you can lift out the fudge. Place the sweetened condensed milk and chocolate in a large microwave safe bowl. Heat on 50% power in 30 second bursts. Make sure you stir the mixture between each burst with a clean metal spoon. Do this until it is just melted (it takes about 1-2 minutes). As soon as the chocolate mixture has melted, you need to work quickly. Stir in the Tim Tams and Milo into your chocolate mixture. Pour it carefully into your prepared tin, and spread the mixture out using a silicone spatula to press it if needed. Cut into small slices and serve cold.